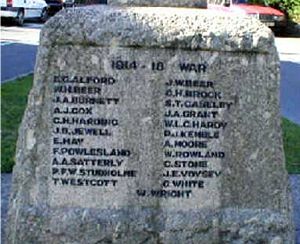 In recent years, the building of new roads in the area surrounding the village of Ide has changed the significance of the position of this War Memorial. It sits uncertainly on a piece of waste land at the entrance to the village rather like a street furniture on a traffic island and seems remote and unconnected with the busy heart of the village, further up the street. of the 2nd Battalion, the Devonshire Regiment. 54022 Driver Ernest George Alford of the 20th Battery, the Royal Field Artillery. Son of William and Sarah Alford. Born in the December Quarter of 1891 in Ide. Killed 31 May 1916 aged 25. J14319 Able Seaman John Walter Beer of the Royal Navy, HMS Monmouth. Son of William and Maria Beer and brother of William Beer (see below). Born in Dawlish in the March Quarter of 1894. Died at sea off the coast of Argentina 1 Nov 1914 aged 20. 9399 Private William Henry Beer of the 2nd Battalion, the Devonshire Regiment. Son of Walter and Maria Beer of Tucker's Cottage, Ide and brother of John Walter (see above). Born in Kenn in the December Quarter of 1892. Died 10 March 1915 aged 22. 18398 Private George Henry Brock of the 2nd Battalion, the Devonshire Regiment. Son of Charles and Alice Brock. Born in Ilsington, nr.Newton Abbot in the June Quarter of 1894. Worked as a farm labourer at Whiddon Down. Died 7 April 1918 aged 23. Resting place not known. 202548 Private Stanley Taylor Caseley of the 1st/4th Battalion, the Devonshire Regiment. Son of Samuel and Charlotte Caseley. Born in Exeter in the December Quarter of 1881. Died 27 August 1917 near Basra at the age of 36. Resting place not known. 202221 Chief Petty Officer Alfred John Cox of HMS Toronto. Son of William and Susannah Cox of Ide and husband of Amelia Mary Cox of 15 Churchill Rd., St. Thomas, Exeter. Previously worked in the market garden at Deer Park. Born in Dunsford 18 November 1881. Died 23 December 1917 aged 36. 1251 Corporal John Adams Grant of the 1st/5th Battalion, the Devonshire Regiment. Son of George and Mary Jane Grant of Old Exeter St.,Chudleigh. Previously worked as a farm labourer at Whiddon Down. Born in Crediton in the March Quarter of 1890. Taken prisoner in Turkey. Died 4 July 1916 aged 26. 2010 Private Charles Henry Harding of the 1st Battalion, the Gloucestershire Regiment. Son of Frank Harding. Born in Exeter in the December Quarter of 1895. Died 10 June 1916 aged 21. 184724 Corporal Walter Lawry Chaplain Hardy of the 331st Road Construction Coy, the Royal Engineers. Son of William and Mary Ann Hardy of Ide Post Office and husband of Daisy Maria Hardy of 1, Carmarthen Rd., Plymouth. Born in Ide in the March Quarter of 1881. Died 28 March 1918 aged 37. Pioneer Jack Bate Jewell of the Signals Depot (Fenny Stratford), the Royal Engineers. Son of the village schoolmaster William Ashton and Helena Grace Jewell of School House, Ide. Born in Wear Gifford in the March Quarter of 1899. Died of his wounds in the Birmingham Military Hospital 21 March 1917. aged 18 Buried in St. Ida's Churchyard, Ide. 1890 Lance Corporal Philip James Kemble of the 1st/4th Battalion, the Devonshire Regiment and attached to the 2nd Battalion of the Dorsetshire Regiment. Son of William and Annie Kemble of Primrose Cottage, Ide. - his father was a police sergeant. Born in Ide in the March Quarter of 1894. He trained as a teacher at St. Luke's College, Exeter. Killed near Basra on 22 November 1915 aged 21. 150044 Sapper Ernest Alfred May of the 119th Coy. Railway Operating Department, the Royal Engineers. Son of Samuel and Anna Maria May of Bovey Tracey. Lodged with Mrs. Kemble at Primrose Cottage. He was a packer (i.e. track maintenance) at Ide Railway Station before volunteering for war service. Born in Drewsteignton in the June Quarter of 1884. Killed 23 August 1916 aged 32. 309666 Private Alfred Moore of the Tank Corps. Son of Alfred and Margaret Moore of Woolmans, Ide. Born in Ide in the December Quarter of 1899. Died of his wounds 5 November 1918 aged 19 in England and buried in St. Ida's Churchyard, Ide. 42700 Private Frank Powlesland of the 9th Battalion, the Devonshire Regiment. He was the son of Matilda Powlesland and the late Robert Powlesland. He lived in the College at Ide at the time of his enlistment. Born in Ide in the December Quarter of 1897. Died 2 April 1917 aged 19. 2165 Private Walter Edward Rowland, bugler in the 1st/4th Battalion, the Devonshire Regiment. Son of Walter and Rose Rowland of Hallets House, Ide. Born in Ide in the September Quarter of 1896. Died 3 February 1917 in the Basra area aged 21. Driver Augustus Alfred Satterly of the 1096th Battery, the Royal Field Artillery. Husband of Harriet (nëe Sanders). Born in Ide in the June Quarter of 1889. Died on 5 March 1919, aged 30. Buried in the churchyard of St. Andrews, Bere Ferrers. 43852 Private Charles Henry Stone of the 12th Battalion, the Durham Light Infantry. Son of Charles and Maria Stone of Ide. Born in Ide in the September Quarter of 1889. Died of wounds 7 June 1917 in France aged 28 . Second Lieutenant Paul Francis William Studholme of the 1st Battalion, the Devonshire Regiment. Son of William and Mabel Studholme of Perridge House, Ide. Born in 1898. Killed 4 October 1917 aged 19. He died taking part in the first and only cavalry charge of the Great War. 108622 Private Thomas Westcott of the 1st Canadian Mounted Rifles. He emigrated to Canada before the war began. Son of George and Mary Ann Westcott of Ide. Born in Ide in the June Quarter of 1885. Killed 2 June 1916 aged 31. He never married and is buried in Ide churchyard alongside his father and mother. Private George White of the Royal Army Medical Corps. Killed 27 August 1914 in Cork, Ireland. Further information not yet available. 24091 Private William Wright of the 8th Battalion, the Devonshire Regiment. Son of Samuel and Maria Wright of Taylor's Cottage, Ide. Born in Ide in 1896. Died 4 October 1917 aged 21.